Hi beauties! It’s Carina from CarinaConnelly.com, and today I’m here to share three super chic new ways to style your hair with a hair donut (or sock!). These styles are extremely easy, extra stylish and perfect go-to hairdos for the upcoming holiday season. If you’re looking for a few new ways to style your hair with lots of volume, try one of these gorgeous styles! Here’s a fresh twist on the ever-popular sock bun! Try adding a braid to wrap around the bun to really spice things up. Start with hair in a high ponytail, centered on the top of your head. Slip sock or hair donut over ponytail. Fan out ponytail so there is hair overlapping donut all the way around. Slip another elastic around hair donut and original ponytail. Fluff bun to desired fullness. With the ends, begin a simple three-strand braid that wraps around bun. Finish style with a spritz of hairspray. Try this style on hair that’s a few days old. Or, if your hair is extra slippery, try roughing up your locks with a texturizing spray. Fall in love with this voluminous style that can be easily dressed up or down. If starting with clean hair, prep hair with a texturizing spray. Place hair donut in crown and pull a small section of hair over it. Secure donut with bobby pins on either side. Create part and backcomb the entire crown area. Pull backcombed section into a half up style. Twist this section one time and secure with bobby pins. Take bottom section and twist it up towards top section and free form it into a bun. If you have super straight hair, try setting it with hot rollers or a curling iron before styling. Here is a gorgeous modern take on a vintage style! Styling your hair away from your face (and with a bit of volume in the front and top) helps open up your face and draw attention to your beautiful eyes. Place hair donut a few inches back from hairline. 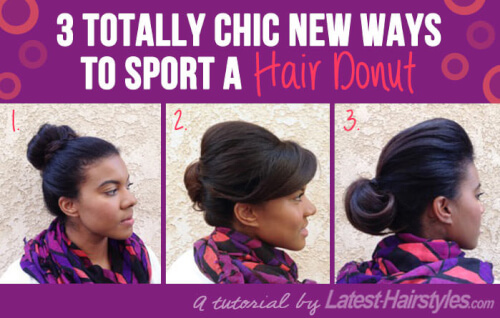 Pull a small section of hair over donut and secure with bobby pins. Backcomb the top and sides. Smooth the backcombing and pull hair into a ponytail at the occipital bone (the bone that sticks out in the back of your head). Grab ends of ponytail and wrap them under. Roll ends up to hair elastic and secure with bobby pins. Gently fan out looped ends and secure sides to ponytail. Finish style with a good spritz of hairspray. If your ends poke out of loop, don’t fret! Simply spritz them with hairspray and smooth into place. If you’re looking for extra volume, don’t be afraid to play around with a hair donut to help achieve extra voluminous styles. There are so many fun styles to try using the donut in unconventional ways. Just use your imagination, a bit hairspray, and have fun with it! Be sure to visit me at CarinaConnelly.com for even more hair tutorials, reviews and beauty chitchat!